Out of the blue, Apple has released iOS update 4.3.5 for iOS devices. 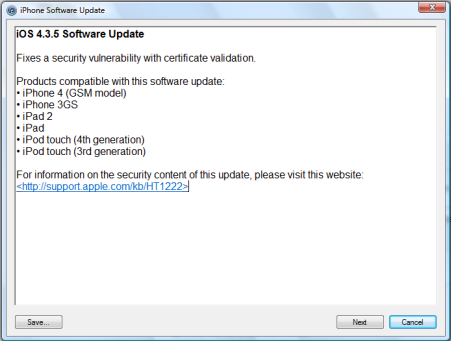 According to Apple this update ”Fixes a security vulnerability with certificate validation.” This comes hot on the heels of the 4.3.4 update that was released July 15 which plugged up a PDF vulnerability. You know the drill … hook up your iOS device to your computer, fire up iTunes and hit the “Check for Update” button.